Earlier, I wrote about the meanings of distance for travellers on the early railways. But what did distance mean for those who observed the new engines on wheels from the outside, as they came thundering past? An important painting from the 1880s addresses precisely this question. 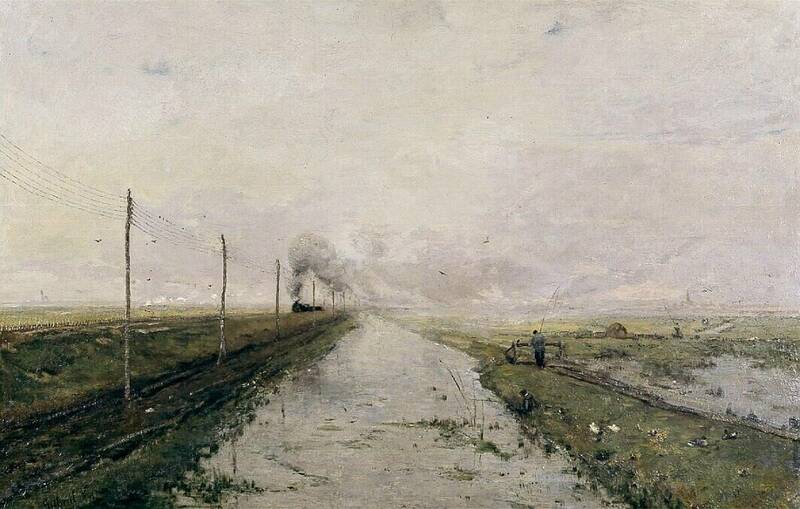 ‘Il vient de loin’ – he/it comes from afar – by Dutch impressionist Paul Joseph Constantin Gabriël has at least three things to say about distance. P.J.C. Gabriël, ‘Il vient de loin’, Kröller-Müller Museum Otterlo, the Netherlands, no. KM 100.143. Most obviously, this painting problematizes progress. Many visual and literary artworks of the nineteenth century set up a dichotomy between tradition and progress, between nature and technology, between a supposedly static country-side and a dynamic industrial sector. Some artists were enthusiastic about technological developments, others critical, a third group ambiguous. Gabriël, too, clearly referred to these contemporary concerns in his work. Not for nothing, Gabriël’s painting is reminiscent of J.M.W. Turner’s famous ‘Rain, Steam and Speed’, which like many works of its time emphasised both the beauty and the threat of steam technology. Take even just Gabriël’s title. It makes sense to read this from the perspective of the angler resting against the gate in this Dutch polder landscape: representing the local and the traditional, the angler sees the train ‘coming from afar’. Indeed, the technology of steam locomotion arrived in continental Europe from across the sea: developed in Britain, steam trains may initially have been considered an exotic technology in the rest of Europe. The steam engines used on the early Dutch railways even continued to be imported from Britain for quite some time, for lack of a local industry. Of course, ‘afar’ may refer to the individual train in the picture, too. The angler looks like he has just come sauntering into the scene from a nearby farmstead. Within his frame of reference, it might be argued, the train has already travelled a lot of track before entering into view – although we are probably talking about a few tens or hundreds of kilometres at most. Trains cross vast distances; farmers and fisher-people stay put, the painting seems to say. In all these cases, the new technology can be read as an alien presence in this landscape, and if this was indeed the predominant perception in the 1880s, we should not be too surprised if the railways occasionally met with a hostile reception. J.M.W. 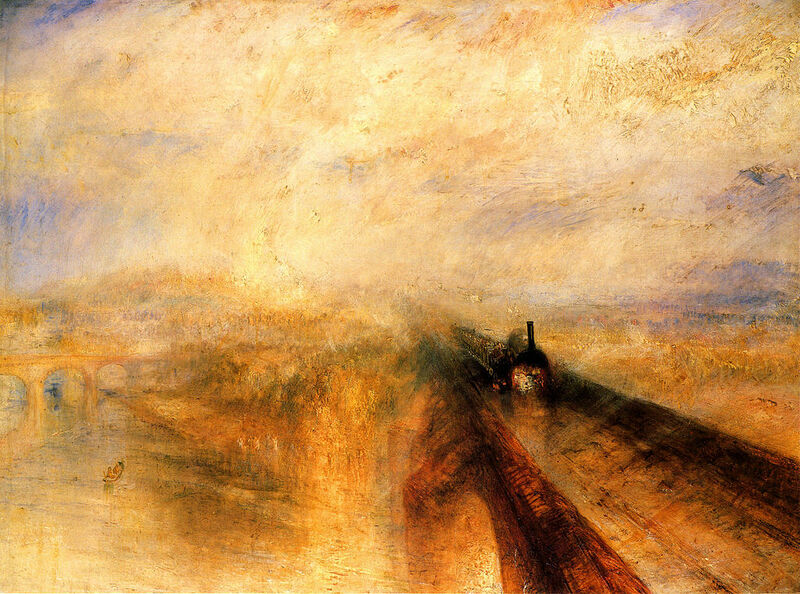 Turner, ‘Rain, Steam and Speed – The Great Western Railway’, National Gallery UK, no. NG538. Available on Wikimedia Commons. What makes this painting interesting, however, is its ambiguity: who exactly is coming from afar? Rather than the train, the title could refer to the angler. This interpretation makes a lot of sense if we follow the painter’s cue to look at the angler: an Everyman. It is he who comes from afar. That is: humankind has got far: from humbly hunting for food, through shaping the land to make it suitable for farming, to the modern industrial economy. This second interpretation sits equally comfortably with prevalent nineteenth-century views. And so, when looking at the steam engine, the angler is really looking at his own achievements, perhaps pondering whether they please him. But possibly the most interesting view this painting offers on distances has little to do with nineteenth-century debates. Instead, it has everything to do with a sensation that cannot have been unique to the nineteenth century. We see: a polder landscape. A canal in the middle. On the right: anglers, some ducks. On the left: a telegraph line, the approaching train still in the distance. And two thirds of the painting: sky. A single vanishing point, a simple composition. 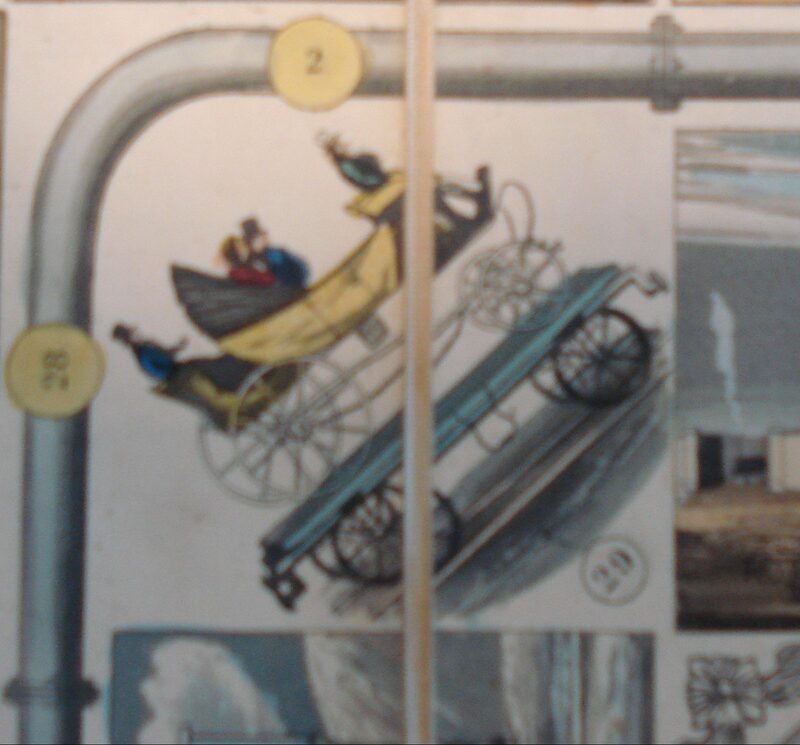 What’s more, the entire picture is permeated by the single element of water. The sky is filled with clouds, the air with steam; the land is bisected by a canal and the earth saturated with groundwater. The anglers find their food in the water; the travellers power their movement with the help of water turned into steam. This is a thoroughly wet scene, a scene with much less contrast or conflict than for instance Turner’s ‘Rain, Steam and Speed’. Yet we know the train is coming. Its approaching cloud of steam seems to progressively envelop the land. Not just that, but it moves from the central vanishing point to the front of the scene. It gets all the attention, that of the angler as well as ours. It will enter the landscape and for a brief moment be at its very foreground, dominating the scene with its noise and its steam, its hard wheels on the track, its smells and its black body towering on the embankment; for a few seconds the angler resting against the gate will hear or see nothing but the train… and then it’ll be gone. It is this ephemerality, the fleeting quality of this sensation of a train passing by, that Gabriël pictures. He pictures not just the brief moment of the train’s overwhelming presence, but also its absence on either side of that moment. ‘Coming from afar’ then means: being there for an instance only, and soon belonging to another place again. It is a sensation we know all too well, and one that overlaps with some of the sensations had by people on a train. 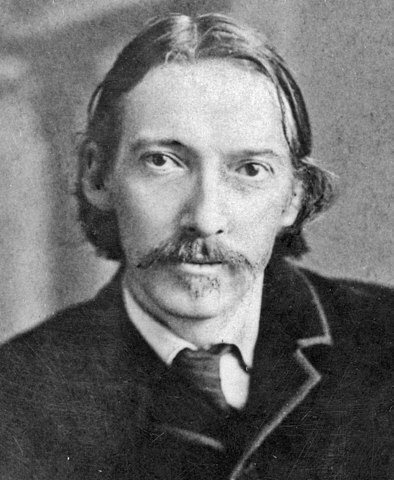 Robert Louis Stevenson in 1887. Wikimedia Commons. This post grew from my article ‘Trains, Bodies, Landscapes: Experiencing Distance in the Long Nineteenth Century’, published in The Journal of Transport History (2019). It was also published on the website of the Hakluyt Society. ‘It’s a small world’ – nay, a positively ‘shrinking’ one. How often do you not hear these words used in order to praise the newest communication and transport technologies? Or, equally, to condemn mass tourism? The truism can be found in sales and politics, journalism and academic research alike: since we no longer have to walk in order to get from A to B, or sit on a horse, or even drive a carriage, our bodies no longer feel how great a distance we are covering. Trains and planes have annihilated space. Our journeys have become ‘disembodied’. What is more, we have stopped noticing the landscape we are travelling through, because we stow ourselves away in cabins and compartments that isolate us from the trees and the rocks and the waves that surround us. We therefore no longer register the journeys we are making: the only things left now are departure and arrival. 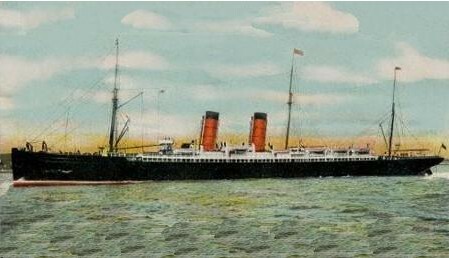 Modern technology captured in a Blue-Riband-winning ocean liner: RMS Etruria, built in 1884, as shown on a postcard. Bavinck would have sailed on a roughly similar ship. Wikimedia Commons. Economically speaking this is true: the cost of carrying people across the globe has been on the decrease for centuries, as ships and roads and other transport technologies have become ever more efficient. But is it equally true when we consider how we feel about distances? Do we no longer notice that Cape Town is further from Budapest than it is from Kinshasa, simply because we might take a plane (rather than walk) to go to either place? And does the ocean literally feel narrower now than it did a hundred years ago, because we have boats that take us across faster? With this question in mind, my work as an historian led me to scrutinise dozens of historical travel narratives and the titles of many more. In the end, I had to conclude that at least European experiences have not in fact changed so much. However up-to-date and speedy their mode of transport, people could not help keeping a physical sense of distance. 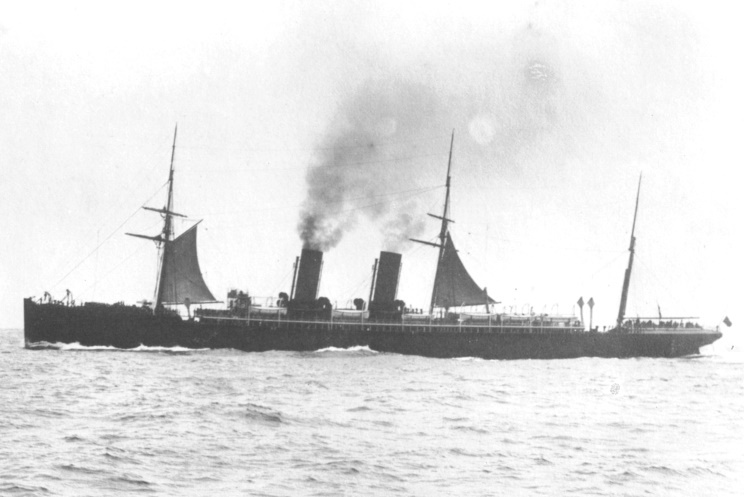 This photo of RMS Etruria already gives a better impression of the lonely situation of ships like these when under sail or steam. Before 1910. Wikipedia. Another major factor was the landscape. A nice example is offered by Herman Bavinck, a Dutchman who in 1892 made a three-month journey to America. Over the course of the preceding century, sailing times from Europe to North America had been vastly reduced, from several weeks at the start of the century to just 130 hours in Bavinck’s days. 130 Hours were therefore comparatively quick in the eyes of his contemporaries, and his journey would also have been relatively comfortable. We are talking the time of the Titanic, and on his own ship, Bavinck would certainly not have travelled third-class. For Bavinck, the transatlantic distance was vast, the voyage boring and America ‘far’ and ‘distant’. This is because what mattered to him was not the objective duration of his journey – a little over 5 days – but the insistent repetition of a single landscape type: water, and nothing but water. A ‘wondrously large’ space: Niagara Falls used for its water power. Photo published in 1890. Wikimedia Commons. wondrously large […] We do not understand its expanse. Bavinck is just one example of the many travellers for whom their own bodies and the landscapes they travelled through continued to give them a pronounced sense of distance – or proximity – with no hard and fast relation to the ever shortening lengths of time it took to get somewhere. This post is based on my article ‘Trains, Bodies, Landscapes: Experiencing Distance in the Long Nineteenth Century’, published in The Journal of Transport History (2019), which contains many more stories about distance in travel writing. Quotes are from James Eglinton’s translation of Bavinck’s ‘My Journey to America’ which appeared in the journal Dutch Crossing, 41 no. 2 (2017). The following brief chapter recently appeared in a book called Railway Cultures, which forms part of my collaboration with the British National Railway Museum. It’s a chapter about trains and bikes. Unfortunately, the editor had no space for images of trains or bikes. Luckily, space is not an issue in an online publication like this. Sharing is en vogue. The past few years have seen a lot of initiatives for shared transport, whether they grew from environmental concerns, economic necessity, or simply because sharing is a highly marketable concept. However, if sharing is what we talk about, that does not necessarily mean we are also good at it. 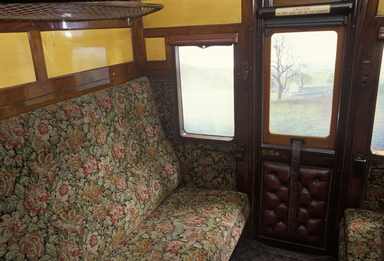 Although this is a third-class interior, it shows the sort of compartment Virginia Woolf would have been familiar with from her suburban journeys. 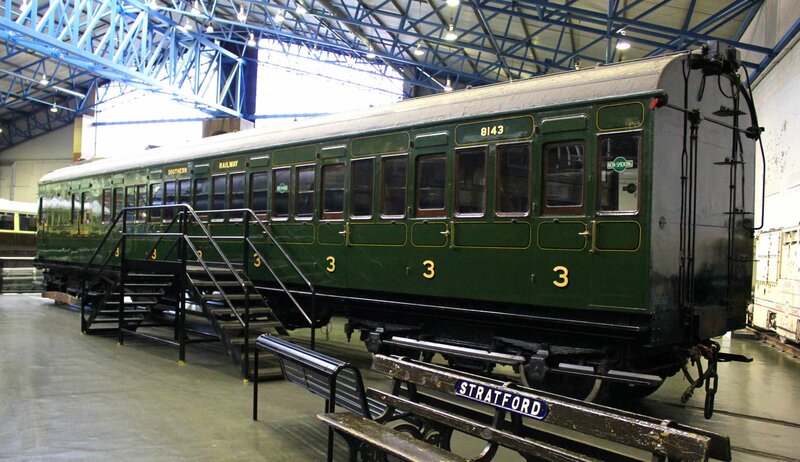 Southern Railway 4-Sub electric motor coach S8143S (built 1925), National Railway Museum no. 1978-7069. Life’s what you see in people’s eyes; life’s what they learn, and, having learnt it, never, though they seek to hide it, cease to be aware of […] Five faces opposite – five mature faces – and the knowledge in each face. Strange, though, how people want to conceal it! Marks of reticence are on all those faces: lips shut, eyes shaded, each one of the five doing something to hide or stultify his knowledge. One smokes; another reads; a third checks entries in a pocket book; a fourth stares at the map of the line framed opposite; and the fifth – the terrible thing about the fifth is that she does nothing at all. She looks at life. Ah, but my poor, unfortunate woman, do play the game – do, for all our sakes, conceal it! Had Woolf lived in 1990 instead of 1920, she would have owned a car and driven up and down between her two homes. As it was, she lived in the golden age of rail travel, and, more specifically, in an age during which people were used to sharing their means of transport. When we take a peek into one of the carriages from that time, kept by the National Railway Museum, we immediately sense what it meant for six strangers to share this confined space for a few hours. The space only seems the narrower because of the textile flowers that push themselves forward from the benches. Every sigh could be heard, every neighbour’s pulpy page read from the corner of one’s eye. Woolf’s journeys therefore offered the author a natural space from which to observe and imagine the tangled lives of the anonymous figures whom she loved so much, and on whom such a great part of her work centres. The same carriage, standing in the museum. Trains might be called the pinnacle of public transport. In no other vehicle do we habitually share a single space with so many other people, while also sharing an infrastructure – the railway – with many, many more. Such sharing carries a high moral status in our world. Whether we look to the Bible for guidance or to Sesame Street, we are admonished to be hospitable, generous and accommodating. Sharing spaces, services and goods also has practical benefits: it is cheap, it is social, and, if the shared service is centrally or collectively managed, it takes away some of the hassle and responsibility faced by individual owners. When it comes to transport, trains, together with trams and buses, form the most energy-efficient technologies for the middle and longer distances, while also saving their passengers time and work. For the shorter distance, the same can be said of bicycles. Although the benefits of sharing have long been known, low incomes, housing shortages, climate change and a range of technical innovations have made sharing a serious option for a growing number of people over the past decade. Some of them have been motivated by the desire to cut greenhouse gas emissions. For many more, hit by the Recession, sharing is a bitter economic necessity. As they move in with their parents or take their children back in, opt for the tram or hire a bike, they share in order to save money. But the marketing departments have also done their work. They have turned sharing from an embarrassment to some, into the new cool. Now, all who can afford any choice want to be a part of the sharing economy. Some of this successful marketing has been done by those commercial services that have been in the news so much in recent years (Über, Airbnb…). These companies make a profit by skimming the turn-over of the old-school independent entrepreneurs who provide the goods. The new cool may benefit yet another type of provider: those companies that provide shared services themselves, for instance the rental services that replace the things we traditionally owned – the bulbs in our lamps, or the bike in our shed. Passenger transport is one of those sectors currently seeing a surge in experiments in sharing. The most successful often build on the experiences of decades of smaller and sometimes failed initiatives. Looking at one of these recent developments, the development of shared bike systems, we can draw inspiration from two centuries of railway history. 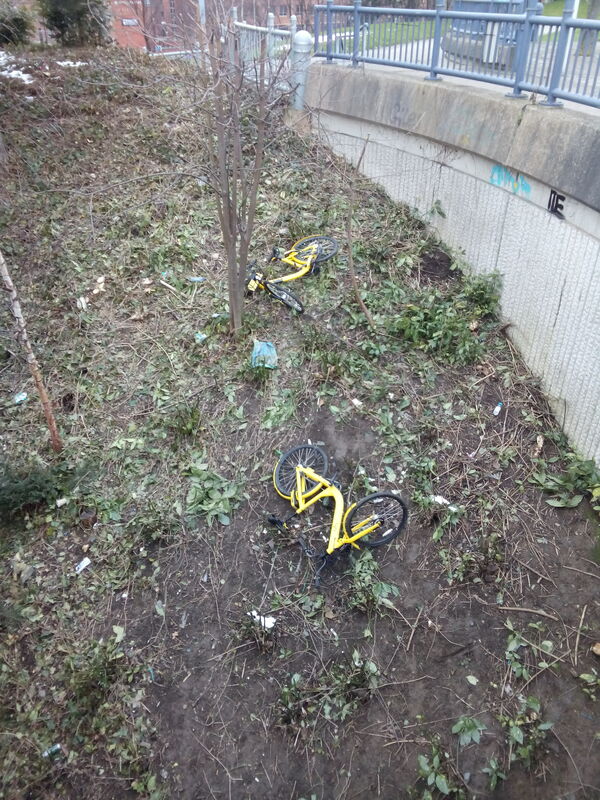 Vandalised Ofo bike in Sheffield (photo: APHG, 2018). The first system of free bike sharing seems to have been proposed in Amsterdam in the 1960s. At that point in time, the scheme failed, at least in the city. In De Hoge Veluwe National Park, the free white bikes were a success. Today, no one could imagine the park without them. More recently, bike-sharing has taken off in cities as well, and even across entire countries where bikes are allowed to cross local boundaries. These schemes have rarely been free, however, and they have always had fixed docking points. 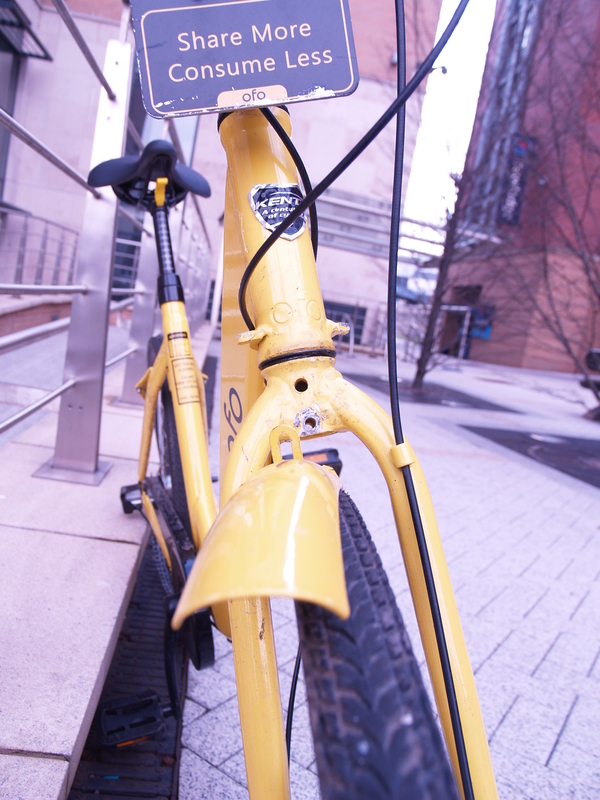 The technology needed to manage subscriptions and payments across a large number of renting stations – often unstaffed to make the system more effective and efficient than traditional bike-rentals where bikes need to be returned to the original outlet – this technology has only been developed over the past two decades. What this technology does, in effect, is offer our somewhat feeble human sharing ethic a helping hand. After registering our identity, and paying for our bike by the day or the hour, we are less motivated to steal it, abandon it or use it ‘indefinitely’. The newest innovation has been the provision of bikes without stations. After use, these bikes may be parked anywhere. Essential to this has been the development of mobile payment and identification technologies, as well as location tracking. This allows users to find a bike in the first place, but it also helps the company to make sure that their bikes stay within their designated area. This new way of renting bicycles has been both welcomed and criticised. On the positive side, we do now find bikes in locations that the owners had not anticipated as potential customer bases, which seems to encourage a demographically more diverse take-up of such schemes. Yet the bicycles are also parked in obstructive and dangerous locations, and they take up parking spaces of privately owned bikes. A professor at the University of Amsterdam has called them ‘scatter bikes’ or ‘litter bikes,’ and various cities have already restricted their rollout. ‘Litter bikes’ in Sheffield (photo: JHMS, 2018). 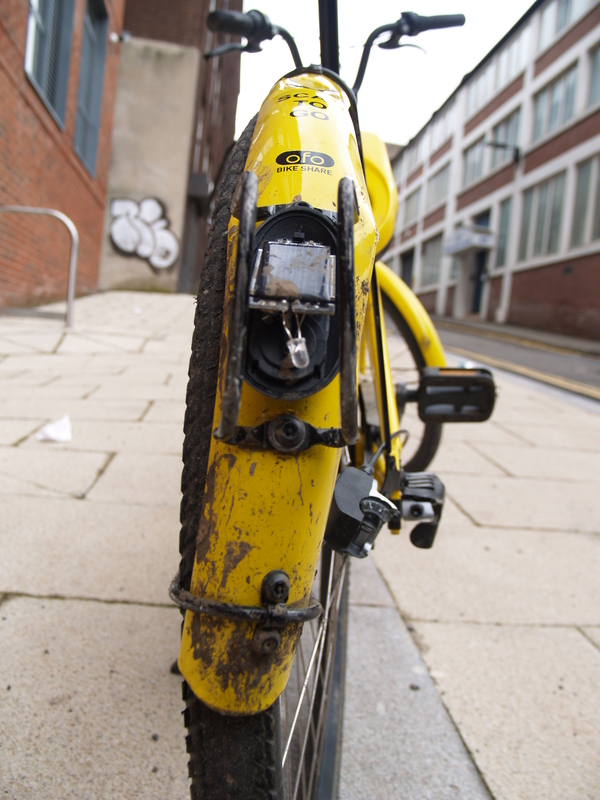 The yellow bikes which have recently started to populate Sheffield are also frequently vandalised, with people taking lock, lights or basket, or simply destroying the bikes’ chain, mud guards or breaks, leaving behind a sorry sight. Such vandalism is made all the easier because of the bikes’ scattered and less visible locations. Although they are checked and redistributed on a regular basis, it does not take any effort to find a few vandalised specimens for a photo, even without using the app. A few weeks after their introduction, the trail of abandoned bikes had started to resemble that other track of industrial wasteland that runs through Sheffield, the derelict railways. So sharing does not just happen. You have to do it. Or rather: we have to do it. Sharing is a skill, and a social skill at that. The question is, therefore: can we, the citizens of Sheffield, York, or any other town or region, deal with this innovation in transport sharing? I believe that there is every chance that these initial abuses will lose their novelty and decrease to a manageable level, and that with the right levels of support in both popular culture and infrastructure policy more people will get into the habit of using shared bikes responsibly. Earlier examples of successful sharing may inspire us in this process. 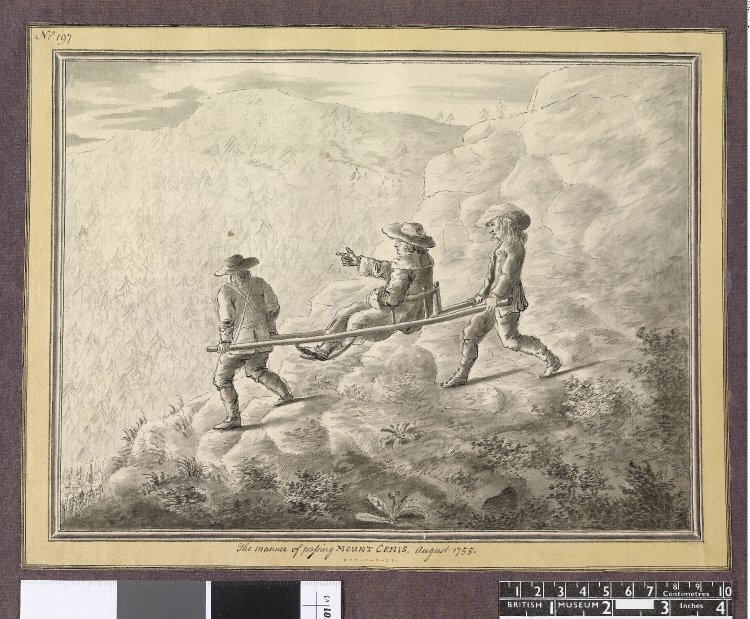 Before the age of sharing: George Keate, ‘Manner of passing Mont Cenis’ (drawing, 1755), British Museum no. 1878,0209.304. When, two hundred years ago, railway pioneers first attached a steam engine to a carriage, they too were asking their passengers to experiment with sharing. To be sure, shared transport was not altogether new. 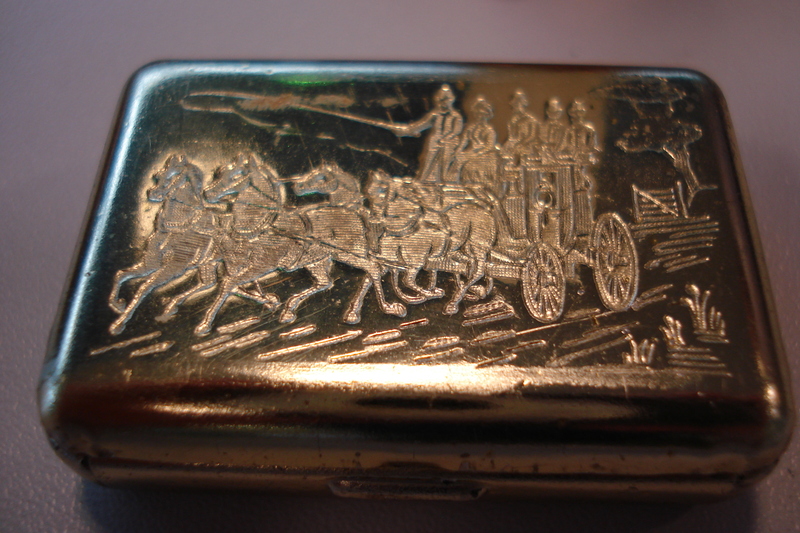 Public coaching services existed across Europe, as did barges drawn by horses over tow-paths, and packet-boats that sailed at regular intervals. Nonetheless, travellers of the early nineteenth century arranged the bulk of their transport themselves and did not share it with strangers. The rich would take out their own carriage or rent one locally; or they would pay carriers to carry them in a sedan, or hire riding animals. The same applied to the poor: they would enlist an acquainted skipper to help them cross a river; during wartime, soldiers would commandeer farmers’ wagons; and the overwhelming majority of journeys were made, of course, on foot. Public transport, in contrast, made up only a small proportion of the passages made by travellers in the early nineteenth century. As we enter the second half of the nineteenth century, we find a quite different situation. Travellers across Europe had come to prefer trains, stagecoaches, steamboats, omnibuses and tramways. Trains, specifically, had quickly become the default travel option for longer distances over land. One example demonstrates how such choices were made. In 1861, a well-to-do Dutch preacher, Marie Adrien Perk (1834-1916), made a journey across the south of Europe. We can discover a lot about the way he travelled in the account he published soon afterwards. Although both private road carriages and shared trains were available to him, the railways were his first choice. Only when on one particular stretch of the journey he learnt that his train would not depart for another two hours, he secured a private carriage instead. Travel accounts from the 1850s all the way up to the early years of the twentieth century show this predilection for shared transport. And then, as now, sharing was encouraged by the transport companies that might benefit from it. 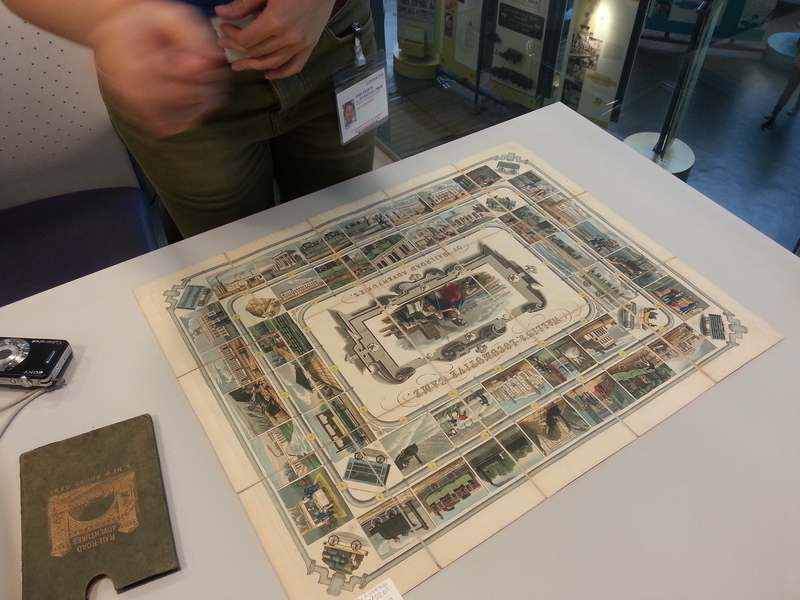 From its very beginnings, the railway sector promoted collective leisure activities. Railway lines organised cheap group excursions, published hiking guides, and facilitated everything from temperance meetings to great exhibitions. After this period of busy sharing, individual transport gained the upper hand in Europe once more. From World War Two onwards, private bicycles and automobiles in particular came to form the dominant means of mobility. Yet the lesson I think that this story has to offer is that it is possible for a culture to adopt a new ethos in travel and other ‘consumer preferences’ – and adopt it quite swiftly, too. So how did this shift in attitudes occur? Various incentives may have contributed to it. Perhaps the most obvious reason people have to choose public transport is that it is cheaper. When sharing a vehicle, passengers benefit from advantages of scale. Naturally, this had been the case for earlier public transport as well, but since labour has been growing more expensive from the second half of the nineteenth century onwards, the effect became more pronounced. What was new, of course, was the railway and the steam locomotive. Trains and trams introduced faster and more comfortable ways of travelling, and since it is difficult to operate individualised transport over rails, a preference for rail transport would inevitably also mean a preference for public transport. Yet an even broader development was on its way. A first clue is that the development just sketched did not coincide with a shift from road transport to rail transport. In both, the same tendency towards sharing was manifest. Although the railways may have spurred such developments along, road carriages and trains continued to co-exist, and in road carriages too, the shift from private to shared usage can be observed. A second clue is that even wealthy travellers – for whom the wish to save money and time were less pressing motivations, possibly even diminishing their status – participated in the shift. Finally, other cultural norms also changed, norms that were only tangentially related to the choice between rail and road. Travellers began to take considerably less luggage on their journeys, being less attached to the food, linen, furniture and other comforts from home, and more interested in partaking in their host cultures. Travellers started to cultivate a pragmatic and flexible attitude. To travel light was the new ambition, also promoted in the media and education: the scouting movement evolved in the same period (prompted too, it must be admitted, by increased militarism). To share things and spaces therefore became desirable in itself. Rather than a golden age for just the railways, we can speak of a golden age of sharing. It is important to acknowledge that this does not mean that the people of that era always found it pleasant or easy to share. As anthropologist Mary Catherine Bateson is said to have remarked: ‘sharing is sometimes more demanding than giving’. Now as then, to share things or spaces can result in a host of discomforts: a lack of privacy; irritation by what is conceived of as noise and dirt, caused by other travellers; and other conflicts that stem from a disagreement about how a space ought to be used. The joyrider and the freerider have already been mentioned. Another threat, the one posed by aggressive co-users of the same space, is among the more serious problems of sharing. And as Van der Hoorn already experienced, a shared service such as a train seat is not always at one’s disposal where and when one likes. Note that Van der Hoorn’s story differs markedly from Woolf’s: even though we are all sharing, the availability and comfort of the shared services we use depends literally on our class. So too does our safety. Rooftop travel on crowded carriages may not be as common in Britain now as it was during the nineteenth century, but it has by no means disappeared globally. Some people have always had a greater say than others in the conditions under which they share, and the selection of the people whom they are sharing with. Nevertheless, during that earlier peak in collaborative consumption, everyone knew what it was like to wait for a train, regardless of their wealth. All sharers had to contend with a wide range of drawbacks, and although occasionally they complained, the point is: they managed. They planned their activities to coincide with shared schedules, they stuck to previous agreements, they coped with their lack of privacy or comfort. Whether sharing was pleasant or not, it was normal. That normality has disappeared in the age of the automobile. Is it now coming back? Are we in the midst of another fluctuation in our culture of sharing – one that has already swung from reluctance to the embrace of sharing once before? In past decades, it has been car ownership that has consistently been portrayed as the ultimate symbol of and means to independence. But our perspective may now be turning, freedom increasingly lying in not owning an expensive vehicle, which, after all, needs to be selected, insured, maintained, parked… In situations where we can establish the right levels of mutual trust and tolerance and do not become too attached to the things we are sharing, sharing may even become enjoyable. Of course, there is more than one way of sharing. In Woolf’s story, sharing is accomplished by most passengers through reticence and concealment. But for Woolf herself (and, perhaps, for her readers) it is also achieved through the pleasures of the imagination. After the necessary financial and design conditions have been met to make collaborative transport a realistic alternative for more people, a new culture of sharing may reach a critical mass. Sharing may become routine and even desirable once more. Even if we do not yet know exactly what that potential new sharing culture for Britain or Europe entails, or what its rules will be, what we do know is that we have acquired the skills to share at least once before. This offers the hope that we can do so again. Mossel, Abraham. De wereldwandelaars. Een zwerftocht door Europa. Maatschappij voor Goede en Goedkoope Lectuur, 1917 (translation by APHG). Perk, Marie Adrien. Uit Opper-Italie [sic]. Schetsen, ontmoetingen, indrukken. Roelants, 1864. Woolf, Virginia. “An Unwritten Novel.” The Mark on the Wall, Oxford UP, 2008, pp. 18-29. Chapter slightly modified from Railway cultures (Longbarrow Press, 2018). The last few weeks, I have been looking at weird objects in Britain’s National Railway Museum. There were games. There were hot-water bottles. There were candle-holders that you could take with you on the train, pin onto the fabric of your chair, and light up right there. And before I make it sound like too much of a holiday (though it was, in a way), there were also lots of books to read. All this because we are trying to find out more about travellers’ experiences, from the beginnings of our railway system in the 1820s until now. My host Dr Oli Betts already published an entertaining piece about our project. In it, he points out how much people in the early days had to get used to the railways. Yet the other side of the story is equally interesting. Existing habits of travel continued to exist. The railways were embedded into older forms of travel. Photo by the author (with my apologies for the low image quality. Should have used a tripod). But why does this railway accessory depict a coach-and-four? An expression of nostalgia, perhaps? Anti-railway sentiment? A little bit like the acme of wedding chic nowadays is to hire an old timer with chauffeur, or indeed a horse-drawn landau? That doesn’t quite explain it. The coach passengers are dressed in clothes contemporary to the production of the railway lamp, not pre-railway clothes. If the matchbox was indeed designed specifically to be included in this railway lamp set, then the message must be one of integration. Coaches were not overrun by the railways, but very much held their own, especially on the shorter distance. Trains and coaches coexisted peacefully in the travel imagination. The message conveyed to the user of the reading lamp was that with rail and road transport combined, you could come a long way. If we do think there is also a degree of nostalgia or romanticism in the image, it is a longing for the country-side; and possibly a yearning for more private forms of transport that did not depend on great quantities of fellow users making the same journey: one thing railway and pre-railway travellers both detested. I spend much of my time debunking technological myths. What is a technological myth? ‘The railways have democratised travel.’ You come across that one a lot. But the social and administrative structure around the technology may well be at least as important as the technology itself. The way the business of the railways is run, matters a lot. The Trans-Siberian Express, for example, can hardly be called democratic. Those who want to approach the picture they know from the movies to any degree, have to spend many thousands of pounds; and a simple fare costs hardly less. 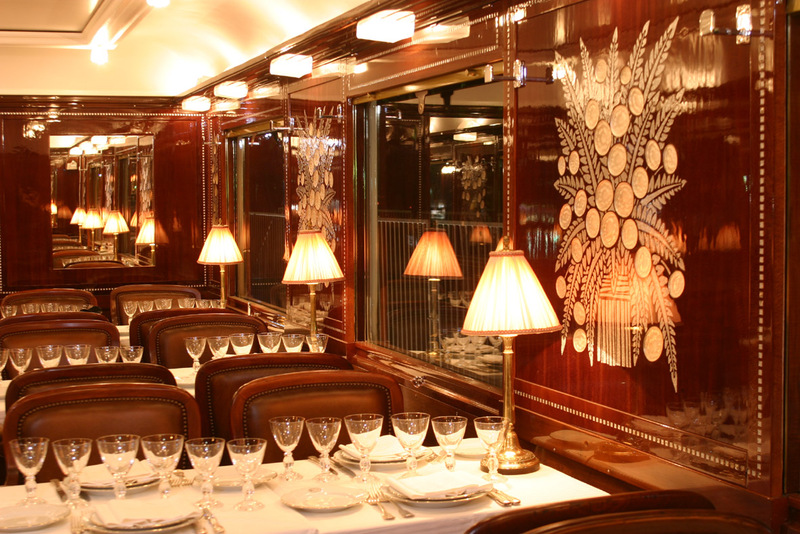 Photo of the similar repro-Pullman Orient Express by Simon Pielow. CC BY-SA 2.0 license. Rather, it is the government-regulated administration of a reliable, simple-to-use and relatively cheap system of rail transport that has made trains such a success in some countries (and not in others). And even there, it took about half a century from the introduction of passenger trains in the 1830s, to get to that point. A technology exists, however, of which I am convinced that it is largely the technology itself that makes it so great. That is cycling. cheap. Bicycles (and monocycles, tricycles and, I hope, hand-cycles) are cheap vehicles, and cheap to repair or have repaired. Of course, it depends on where you are in the world whether they are easy to get by, but at least they are cheaper than most other means of wheeled transport (motorcycles, active wheelchairs, cars, trucks…; excepting, I suppose, roller skates). easy. Cycling is much easier to learn than driving a car. empowering. Most important of all, cyclists are independent. You don’t need anyone to ride a bike. The most common repairs you can do yourself – even though they cost some time, they require little expertise. You do not have to rely on sheikhs and oil barons getting along to hit the road.You are the one doing the moving. The bicycle is truly an auto-mobile. This Mountaintrike, designed by Thies Timmermans, does not even need a road surface to roll. Found on http://commons.wikimedia.org. CC-BY-SA-3.0 license. Not for nothing, bikes have been much-contested: people have been explicitly forbidden to ride a bicycle (servants! ), and many others have been strongly discouraged, either by fears for their decency (women!) or by prohibitive parameters set by governments (obligatory helmets!). Employers, patriarchs and wealthy technological industries (such as the car industry) are no big fans of the independence cycles bring. Jean Béraud, ‘Le Chalet du Cycle au Bois de Boulogne’, probably from the 1890s, found on http://french-painters.blogspot.com. Free of copyright.